Hello friends! I hope you are having a great Saturday! 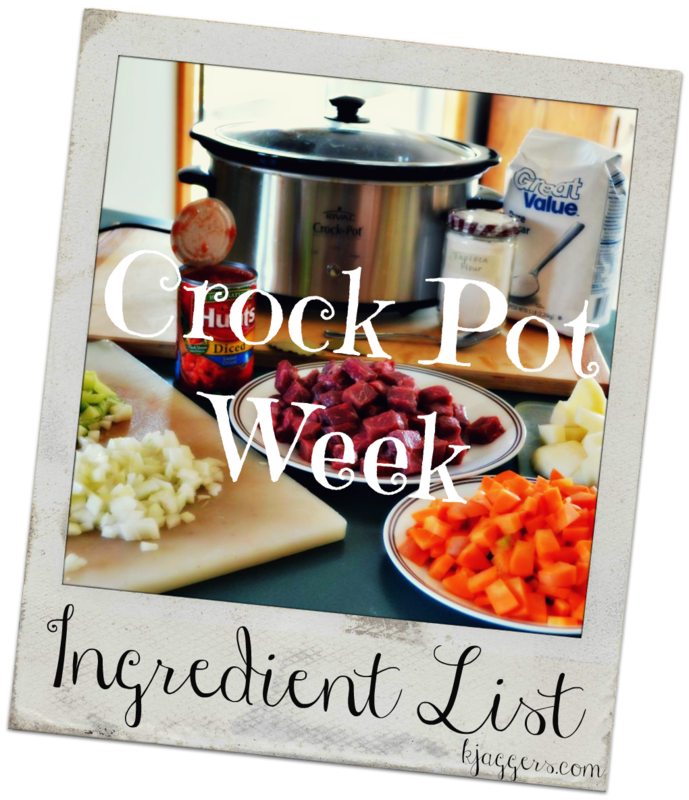 We are going to have an exciting upcoming week in the Jaggers house because its crock pot week! I thought it sounded fun to use the crock pot to make dinner for 7 days.. plus 2 desserts! Soooo.. if you want to follow along.. take some pictures and send them in so I can share them! Keep in mind when looking at the ingredients .. there are many repeat items.. and many of us will have most of the standard items already in our kitchens! I am only posting the indgreidents so you can go shopping now if you want to join up on Monday too. I will post all the steps Post by Post. I actually be a day ahead so I can have the posts done day by day. I will post them the night before.. so you can get them ready before you go to bed or in the morning. I suggest if you haven't already.. add my blog to your bookmarks...follow on GFC and or follow by email. You don't have to do every night .. just follow along how you like! Remember, Sunday Night the first recipe will be posted. You can click the print friendly button at the bottom of the post if you want to have a copy to take to the store with you. I suggest printing the list.. go through your kitchen and mark off what you already have.. then head to the market! Keep in mind.. I didn't list the ingredients for the sides.. They are pretty basic and you can switch them out for whatever you want. The idea is simple.. delicious food.. being made on its own while you do other things. Sometimes the meat has to be first but you can have that done before you finish a cup of your morning coffee.. and you can always do it ahead when its more convenient for you. You can pre make any of these meals and leave them for your family to make if you are going to be away. Most of the recipes are pretty simple below..and only take a couple of minutes to get ready. Some of these recipes are my own and some are not.. I will go more into that with each recipe post. I will do a video to go with each post too. spices you use normally when you brown ground meat for pasta dinners.. Italian blends and such. 1 cup each of three different cheeses, I used jarlsberg, gruyere, and cheddar. Served with an assortment of fresh fruit. 1 lb of cooked breakfast meat of your choice.. I prefer bacon but sausage Is ok too. And ham is always good! For Dinner Sunday… we are having left overs from the week. I am also fixing 2 desserts.. one on Monday and one probably on Thursday! * I am tripling this recipe.. again.. you have to be careful to not burn it. And its great in oatmeal from what I hear! This serves 4, in two ramekins that inside of a 6qt crockpot.But I skip that step!! If you'd like to only use the crockpot..Double the recipe to serve 8, to ensure that there is enough inside of the crockpot so it won't burn on you. 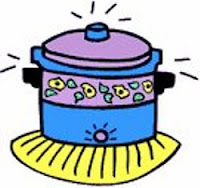 CrockPots work the best when they are at least 2/3 of the way full. 2 cups fresh blueberries (if you do not have access to fresh, use unsweetened frozen) You could even use Comstock fruit if that’s what you have in the house. 3 comments on "Crock Pot Week - Ingredients List! - "
I am looking forward to your meatloaf and lasagna recipes. I need more things to cook in my slow cooker! @ ChanTell E....I can't wait.. should be a fun week.. If you make them..take some pictures and share! @ Glossy.. you can find one really well priced at any big store.. or even the Dollar Store.. Go get one and join up! Happy New Year!